This patient went to the dentist complaining of her teeth being badly stained and uneven.Her dentist suggested 6 porcelain veneers at UR123 to UL123. After the first visit to the dentist we did a wax diagnostic to show the patient what cosmetic result we could achieve, when she was happy with the set-up we constructed the porcelain veneers at our laboratory. 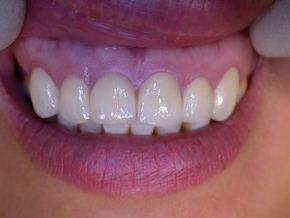 2 weeks later the 6 veneers were fitted and this is the final cosmetic result. 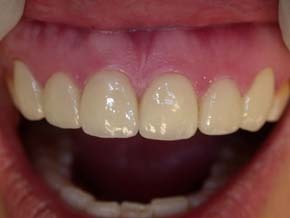 Both dentist and patient were very pleased with the end result.